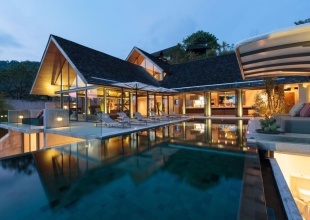 The breathtaking 5-bedroom Villa Kalyana in Phuket is located in the globally renowned yachting destination, the Royal Phuket Marina. The villa is ideal for sea lovers, adventurous explorers, and yachties who adore the beautiful and exquisite scenery of its magnificent location. 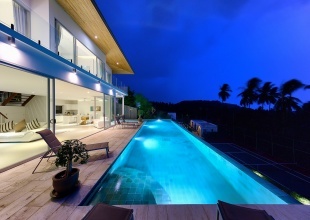 Samsara Villa 5 offers perhaps Phuket\'s most rounded, west coast luxury ocean front villa opportunity at under 5m USD. It is direct Oceanfront, has a 4,000 Sq.m garden with lawns and access to the ocean in addition to the 1,000+ Sq.m villa plot. South facing waterfront villa of 5 bedrooms and 6 bathrooms.Separate guest flat and independent staff building.Southerly tip of Koh Samui with views to Koh Tan and Koh Madsum.Approximately 28Km from Koh Samui International Airport.Minutes from restaurants and shops of the charming village of Thong Krut.Land Area - 3,958 square metresBuilding Area - 1,452. If you enjoy space, peace and nature then Samudra is a whole experience in itself. 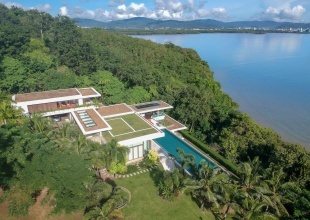 This is one of the most unique properties you will find anywhere in South East Asia and it offers very flexible, luxurious but casual accommodation, spread over a large area, in a breathtaking beachfront location. 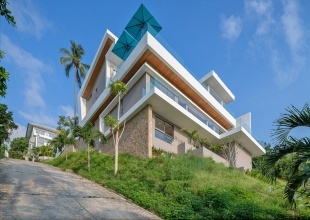 New 4/5-bedroom modern villa in private estate with panoramic sea and bay views and good access to schools, marinas, shopping and airport on Phuket.Priced at 4m USD. That Baht listing price is an approximation of 4m USD1,260 Sq.m of gross floor area on over 2,000 Sq,m of land.Modern minimalist design with all in one living, dining and kitchen area. Over 3 m ceiling heights throughout. 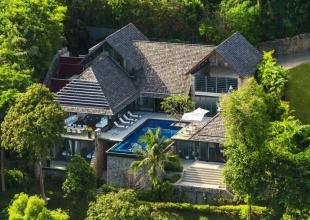 6-bedroom villa accommodation in a world class oceanfront location looking out to Phi Phi islandEnter into a world of privacy and style at the end of your very own private peninsula in a gated private estate.The villa has a large, funky living area with ensuite dining and show kitchen area. The Thai kitchen where your staff prepare many of your meals is behind this and separate. This villa is perfectly placed to enjoy the view of the nearby smaller islands from the southern view and then to enjoy the sun setting from its western view. Offering five large bedrooms and six bathrooms, this three-storey villa also houses an impressive large interior garden, private gym, and a cinema. 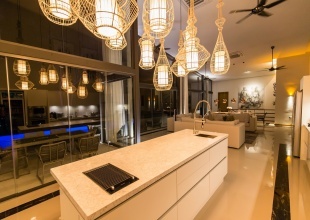 A host’s dream, the villa also has two modern kitchens designed with entertainment in mind. Baan Chom Pha is a great villa, sitting right on the beach just outside the main tourist area of Chaweng.The property is in need of some repairs and has been heavily discounted to allow for the refurbishments. Previously offered at 150,000,000 THB, and now offered at just 120,000,000 THB. Fully furnished 6 bedrooms villa with 96 metre water frontage.Views to Koh Tan and Koh MudsumLand Area - 1 rai 1 ngan 69.4 square wah ( 2,278 square meters)Building Area - 1,013.79 square metres including garage, swimming pool, laundry etc. 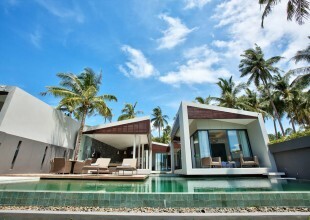 Baan Hinta, along with Baan Hinyai is a modern beach front development features two epic villas that are setting up a new benchmark for architecture and interior creations on the Samui island. This masterpiece uniquely sits on a dramatic sloping site with a series of giant granite boulders cascading into the sea. This is a beautiful villa sitting on the edge of a peaceful Bay, home to just a few neighbours and a five star resort.The property comes fully furnished, ready for the new owner to move in a rent out to holiday makers.Each room has a direct view of the ocean, and the swimming pool an gardens have a private ocean frontage with no passing footfall. 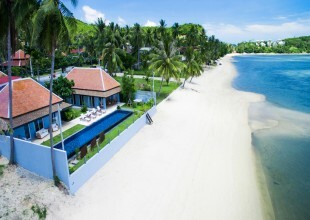 Baan Hinyai along with Baan Hinta, make up this beach front estate features two epic villas that are setting up a new benchmark for architecture and interior creations on the Samui island. 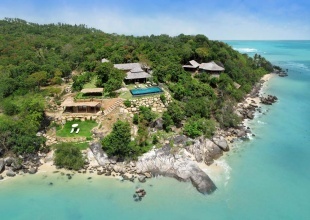 This masterpiece uniquely sits on a dramatic sloping site with a series of giant granite boulders cascading into the sea.Baan Hinyai is a supremely stylish and elegant holiday pad. 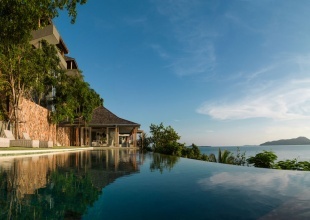 Tasanee in Thai means “beautiful view” and true to the translation, the unobstructed ocean and sunset view from every aspect of the villa is truly breathtaking. Villa Tasanee is perfect for groups up to 12 people, and can hold up to 16 with additional bedding. Brand new, ready to move-in 5 bedroom beach villa in Plai Laem, Choeng Mon.The villa looks directly onto a very private, small bay which is only shared with a handful of neighbours. 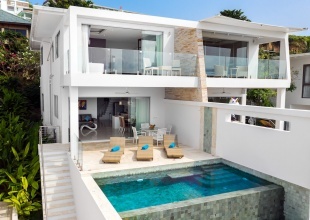 This unique five-bedroom pool villa occupies a generous beach front plot of 2,200 sqm. The villa has a perfect West (or sunset) facing aspect and enjoys a full 35m of premium direct beach frontage on the World famous Natai Beach. 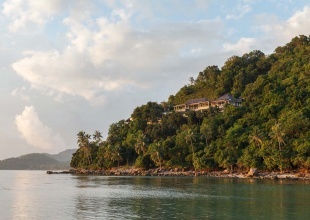 Natai is a glorious stretch of unspoilt sand, just North of Phuket. Phuket International Airport is approx. Suralai is an architect designed exclusive private resort, ideal for families or groups of friends to escape together in stylish yet relaxed surroundings. 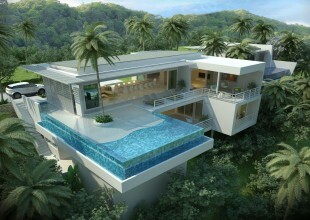 It was also designed to be the most stylish and luxurious private residence on the island. The furniture, fittings and artworks were all painstakingly sourced or custom made for the residence and are of the highest quality. 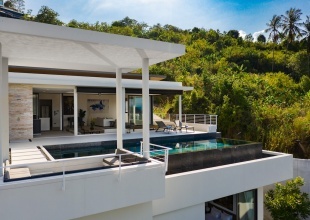 Quartz House is a stylish and contemporary 5 bedroomed privately owned property situated on a mountain top on the South Western tip of Koh Samui. 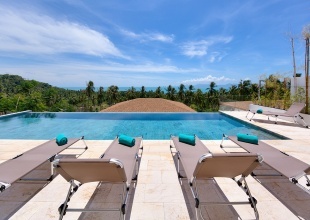 Come to enjoy its breathtaking 360 degree panoramic views of the south west Samui virgin coastsand unspoilt tropical landscapes, including the famous Five Islands sea view. 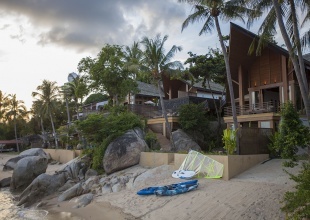 Reduced from USD 3,000,000 to USD 2,200,000 On the soft sandy beach of Big Buddha Beach is Baan Tamarind a villa within its own walled tropical gardens. 3 pavilions with 5 bedrooms provide luxury accommodation for up to 12 adults. 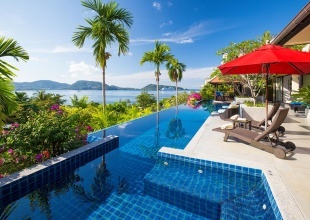 While the sea is only a step down from the garden there is a large private swimming pool. This Tucker Bishop designed villa with connected two-bedroom apartment occupies a site of 1,200sq.m and has 830sq.m of internal living space. A further 200sq.m of terrace, pool and pathways means there is plenty of space to ensure total privacy within the Villa compound. The remainder of the space is made up of landscaped gardens, large enough for badminton or a football knock about. 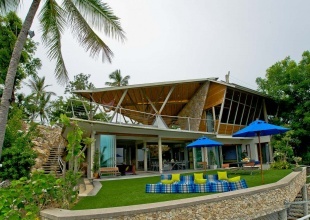 Patong Beach House was completely rebuilt in 2011. It is one of only four private beach villas in the whole of Patong Bay.The villa comprises three bedrooms, three bathrooms, open plan kitchen and living area and under cover alfresco dining area. There is a marble salt water swimming pool at the beachside and a covered, open air roof top terrace. Overlooking the tranquil blue seas of Patong Bay, set high within the upscale Indochine Resort, villa 605 is a unique residence offering panoramic ocean and mountain views.With high quality standards and a special attention to details, the villa provides a generous living space including 4 large bedrooms and 6 bathrooms across two main floors plus a large pool, terrace and garden areas. This expansive and architect designed Koh Samui villa for sale is perched on a gentle hillside and in a prime location directly between the picturesque beaches and exciting night life of Chaweng and Lamai, an ideal choice for those who wish to be away from the hustle and bustle of the tourist life but yet close to all the fun and amenities, making it also an ideal property for holiday rentals too. Baan Dalah is a stand alone villa in the centre of Bangrak beach, located in the North East of Koh Samui.The property has been recently refurbished to a high standard by the current owner and is a unique opportunity to invest in a direct beachfront property at this price point. Baan Flora is a lovely luxury Koh Samui beach villa with four bedrooms and five bathrooms, set in large landscaped gardens with spacious sundecks and a large private swimming pool. 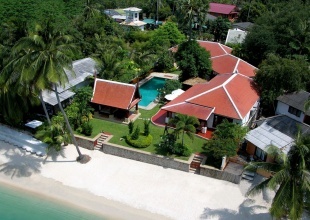 It sits overlooking one of the most tranquil beaches in Koh Samui, visited by few tourists. The only sound that can be heard is the occasional passing of a traditional long-tailed fishing boat. 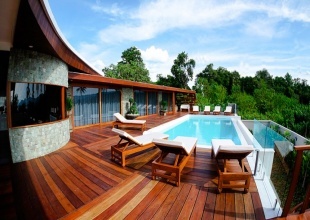 Villa Nirvana is a private and exclusive residence of 1500 m2. Close your eyes and imagine it nestled in the heart of a tropical garden, 200 meters above sea level, spread over three levels. 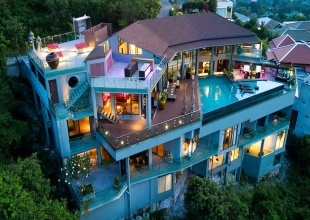 It is ideally located on the island of Koh Samui, in the area of Taling Gnam known as the Beverly Hills of Thailand. A very unique villa for sale in Ban Tai.Built directly on the oceans edge on a slope, giving an exceptional view from every point on the property.Chanote: 2 Rai (3,200 sqm)Por Bor Tor 5: 542 sqmBeach Front: 51 metresViewing is highly recommended.This property was originally thought to be owned by David Beckham according to news reports. Of course this isnt true, but it is a wonderful home. A collection of 4 villas is offered for sale as an investment with an ROI of uptown 10% per year.VILLA TOPAZA spacious, two story residence, Villa Topaz offers indoor and outdoor living space with access from the kitchen and lounge to the terraces. 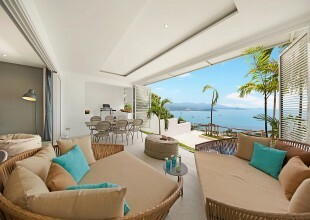 It has sweeping views across Big Buddha Bay.FeaturesSeparate guest bathroom5m x 2. 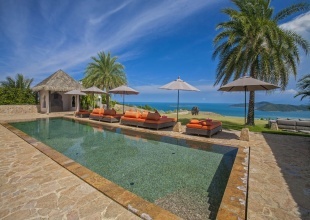 Thai villas for sale on the beachThe philosophy of Mandalay Beach Villas is crisp, clear and simple. Against a backdrop of unerring modern style and sophistication, we exist to create an unforgettable contemporary tropical experience for you. The Azur development is a 12 acre site that offers a mixture of large private villas and large apartments, all with panoramic ocean views, and centred around a great club house available for all owners.The club house consists of a large infinity edge swimming pool, tennis court, spa and massage, bar and cafe and full fitness room. Resale villa at the popular CDP Unique development in Koh Samui.Villa M is the largest property in the gated estate, boasting 6 bedrooms spread over 750 sqm.The main living area is fully open planned, with kitchen, dining room and living area all opening up onto the 18m private pool. Recently reduced to 42,000,000 THBPicturesque villa with 180 degree ocean views front and back, with sunrise to the East, and sunset to the West.The property has 4 bedrooms within the 500 sqm internal area, which opens on to the large garden of almost 1,000 sqm and a generous 95 sqm swimming pool. Reduced from 62,000,000 to 38,000,000 THBA very unique property, built with the highest quality materials and modern electrical touches throughout the property.Set over 2 floors with sunset views out to the nearby Bangrak Bay and the North of the island.Main floor is home to the main open plan living area and three bedrooms, all of which opens onto the expansive swimming pool. 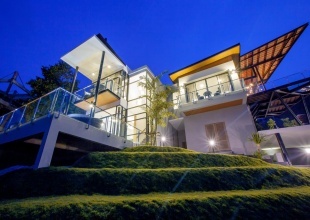 These fabulously designed Sea view Villas are only a short drive from the tropical beaches of Bang Por, Maenam and Bophut and are now available for sale. The development has a total of six villas; being four, three bedroom villas with 350sqm of space and two five bedroom villas with 444sqm of space all on plots of 400sqm. 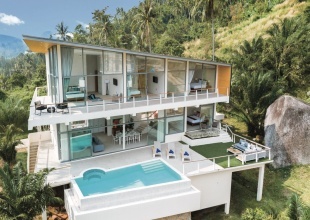 Villa Pina Colada is a stunning brand-new contemporary 6 bedroom residence situated within walking distance to one of the most serene and beautiful beaches of Koh Samui – Ban Tai beach. 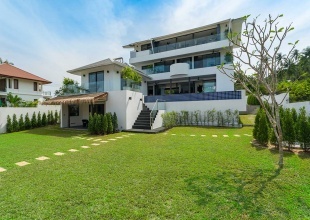 Villa Pina Colada is completed in 2015 and located in gated villa resort Ban Tai Estate. 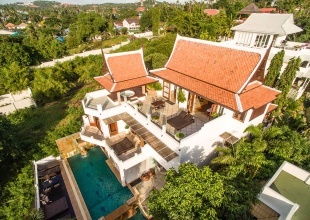 This one of a kind, stand alone villa is set just 500m back from Bangrak Beach in Koh Samui.Set over 4 floors, with 7 bedrooms and large landscaped gardens, this villa is an ideal rental property and perfect for wedding parties.The ground floor has the swimming pool system and large storage tanks at the back. 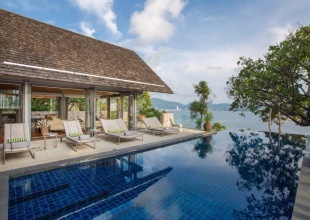 The breathtaking perspectives of Thongson Bay on the east coast of Samui provide the perfect picturesque setting for the Villa as it unfolds its beauty amidst the fantastic views of its surroundings.The elevated Villa is the perfect for those in search of exotic escapes or getaways. 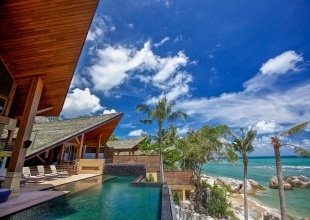 The Villa is 15 minutes away from nearby Chewang Beach.A spacious pool deck is provided with luxury day beds. 4 Bed Luxury Villa, Residence on Private EstateThis tasteful, modern and unique 4 bedroom home is fresh to the Koh Samui market. This property is virtually “brand new”, with one careful owner.In an elite residence in a private community makes this property easy to short list and sure to sell quickly. 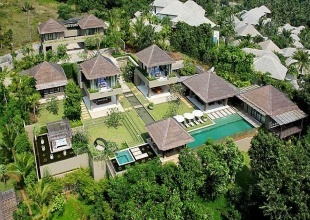 Oasis Samui Villas is a follow-up project from their previous award winning development The Ridge, winner of Best Residential Development Samui 2015.From a total of 19 villas, buyers have a choice of 4 different designs of 3 or 4 bedrooms. 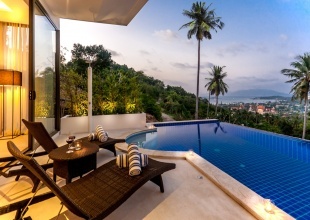 Villa Melitta is a one of a kind property on Koh Samui, ideally located right beside the famous Big Buddha Island.Built over 3 floors, each of the 6 bedrooms and living areas enjoys a panormic view over the local bays and one of the best sunsets in Asis. 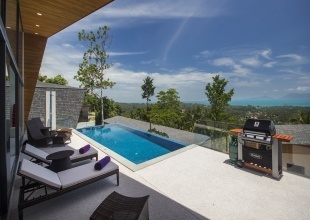 Villa Lulu holiday retreat is 734 square meters of luxury living-space set in a 3056 square meters of landscaped property in a tropical forest just south of the northwestern tip of Koh Samui. Beautiful local beaches (5 mins walk), golf course (8 mins drive), restaurants and shopping are a few minutes away by car. 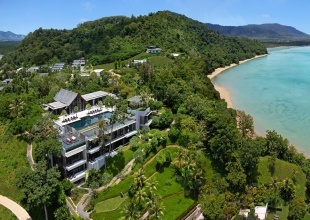 A unique opportunity to purchase a 4 bedroom home with an organic micro farm, aquaponics systems as well as Samui’s leading and profitable Thai Cookery school. This would be a great investment for a family looking to make an income from a home business, or for anyone that would like a change of lifestyle and live from the land with the benefit of harvesting pure organic produce daily. 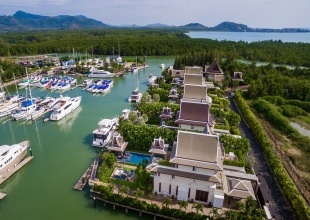 808.4 sqm of ocean front land in the exclusive gated community at Sunset Cove Plai Laem. 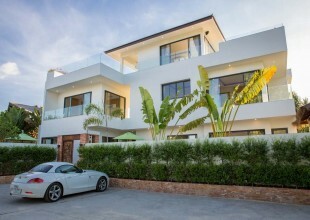 Following on from the success of phase 1 & 2, Verano have now launched a third phase of just 13 villas.Verano enjoys a panoramic ocean view out over the Chaweng beach and the North East of Koh Samui.Each villa has 3 or 4 bedrooms, 4 bathrooms and a private infinity edge swimming pool.Viewing of the show villa is highly recommended, please contact us to make an appointment. Villa V resale villa at the popular CDP Unique development in Koh Samui.The main living area is fully open planned, with kitchen, dining room and living area all opening up onto the private pool. With full length doors that open up completely, the property benefits from panoramic, sunset ocean views over the Big Buddha Bay. Price reduced to 15,950,000 THB and now includes free furniture pack (value USD 1m)Samui Sunset Lagoon Estate is a collection of 6 luxury sea view duplexes. 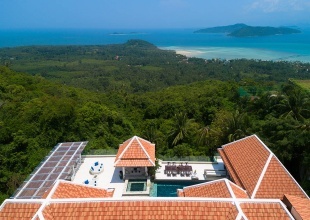 Each looks directly out to Koh Phangan, Koh Som and Bangrak Bay. Houses range from 3-4 bedrooms with prices starting from 15,950,000 thb.Samui Sunset Lagoon Estate is located in the beautiful island of Koh Samui. This luxury 3 bedroom apartment is located within the Unique Residence in Bangrak, in the North East corner of Samui.The development operates as a hotel and come with full facilities including reception, communal pool, fitness room, a restaurant, and 24 hour security.Each unit enjoys a direct sunset view out over Bangrak Bay, which is home to many boats coming in and out from their trips.